OXFORD, United Kingdom, April 27, 2017 — Imperas Software Ltd., the leader in high-performance software simulation and virtual platforms for embedded systems and software development, debug and test, today announced an extended sales and technical support partnership with eSOL TRINITY Co., Ltd. (TRINITY) for Imperas virtual platform solutions in Japan. TRINITY, focusing on design and development of embedded software, will provide pre- and post-sales technical support, consulting, training, and implementation for the complete portfolio of Imperas virtual prototyping solutions. With this new relationship, TRINITY will now handle sales of Imperas products in Japan. TRINITY also leverages the power of their parent company eSOL Co., Ltd., the leading provider in Japan of RTOS and real-time embedded software solutions. TRINITY has proven expertise in embedded software technology in the Japanese market as well as in supporting customers, and will represent Imperas solutions in embedded systems markets such as automotive, industrial, consumer electronics, defense and aerospace. Many such Japanese manufacturers are already using Imperas solutions, supported by TRINITY, which especially benefits automotive embedded software developers. TRINITY will demonstrate Imperas solutions at the Embedded Systems Expo & Conference, in May 2017, at Tokyo Big Sight in Japan. • Imperas support for the eSOL eMCOS RTOS and eBinder debugger for fast, intelligent software debug and test. • Development by TRINITY of Renesas RH850F1H models for Imperas virtual platforms, with the ability to run the eSOL eMCOS real time operating system. • Development by eSOL TRINITY of the Renesas RL78 processor model, along with example virtual platforms, and support for the new model in the Imperas advanced software development tools. This new partnership builds on the previous relationship between Imperas and eSOL TRINITY dating from November 2015. For more information about eSOL TRINITY, please see www.esol-trinity.co.jp. For more information about Imperas, please see www.imperas.com. Follow us on Twitter @ImperasSoftware and on LinkedIn. 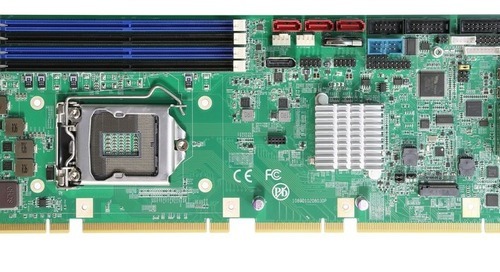 The Slot SBC is based on the new Intel(r) 6th Generation Core(tm) processors (formerly codenamed "Skylake-S").